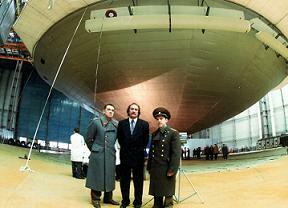 Russia Is Making Flying Saucers. DUN-DUN-DUN! 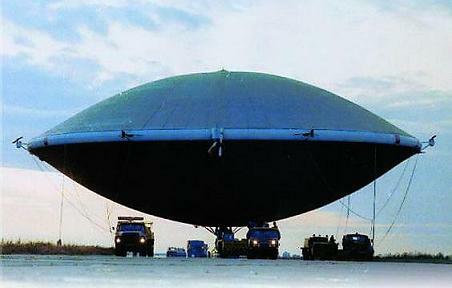 Russian company Locomo Sky is in the process of building a fleet of cargo hauling aerostat aircraft that resemble UFOs. Conspiracy theorists everywhere are salivating with anticipation. Russia’s latest endeavor to produce commercial grade lighter-than-air aircraft seems a little strange. The “aerostatic thermoballasted vehicle” from Locomo Sky looks like something straight out of a 1950s UFO movie. The flying saucer shape isn’t just for show though, it helps the aerostat travel through the air with a minimum loss of energy to air resistance. According to their press release, Locomo Sky has started building a construction facility in the Ulyanovsk region of Russia to create a fleet of the aircraft. These airships, more commonly called Locomoskayners, are already used in geographical surveys. That version of the craft has a 1000kg (2200 lbs) carrying capacity with a crew of 2-8. Locomo Sky is hoping to build a huge version of the Locomoskayner that would have a 600 metric ton capacity or even carry 11,000 people. The company presented this idea recently to President Dmitry Medvedev, reportedly with good results. With millions already invested, it seems possible that Russian skies may be filled with flying saucers hauling cargo very soon. It sounds too wacky to be true, but it is. Check out a simulation video of the large Locomoskayner in action after the break. Thanks to Gringo.Comtv.ru for the video. Can’t say that the audio really helps me take this seriously though. BEWARE THE RUSSIAN FLYING SAUCERS! Russians and flying saucers. The future of cargo transportation?